Wellllllp it's that time again. I never know where the weeks go?! When we were getting ready for work this morning I said to Dan that today is his son's 23-week-in-utero birthday, and he stopped in his tracks. "23 weeks already?" Welcome to how I've been feeling, sir. I am feeling slightly less anxious about things now that I think we may have finally found a contractor to build this baby a place to sleep. Once that construction project is finished, it will be a big worry off of my plate for sure. Anyone who follows me on Pinterest can attest to the fact that I've finally been pinning some baby boy room ideas, so we're getting there. Not too much longer! With that, let's get to the stats. 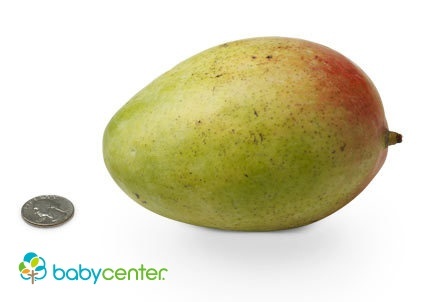 Size of Baby Boy: A mango! Babycenter tells me that baby "can feel me dance" this week. What a weird thing to say. My first thought after reading that statement was, "good thing he can't see me dance yet (only hear)" followed by "I hope he doesn't get my dance moves." Ha! He weighs just over a pound and is around 11 inches long. Blood vessels are developing in his lungs to assist in breathing, and baby boy is now more familiar with loud noises (Such as Lilly squealing and Layla barking at nothing...but not the doorbell because we disconnected that sucker. Take that nap-ruining solicitors!). Weight Gain So Far: Per my home weigh-in this morning, I'm still holding steady at +10 lbs gained. Not sure how it's possible that I didn't gain 10 lbs last week alone, but I'll take it! Cravings: Tempura sweet potato sushi was the most recent craving, and I satisfied it over the weekend. Funny story, when I asked Lilly what she wanted for dinner tonight, she said "sushi." I guess that means she enjoyed family date night as well! Aversions: Pork is still the only thing that comes to mind here (and it is not even a consistent aversion, I'd say around 85% of the time). So thankful! Symptoms: In addition to the usual clogged pipes and tiredness, I have added some insomnia to the list in the past week. That can go away at any time and I won't miss it one bit. Movement: "Mellow baby" no more! 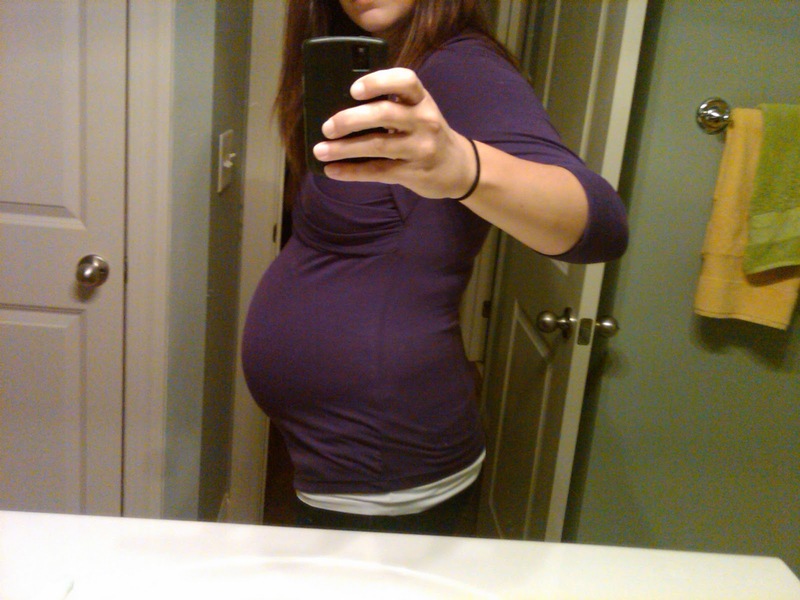 Baby boy likes to play soccer in there, and you can actually see it and feel it from the outside now, too. I feel the most movement when I lay down to go to sleep, but he moves during the day some as well. Again, the kicks/jabs/movement are mostly limited to my lower stomach, so I'll be interested when I go to the doctor to find out whether he's still breech (if they are even able to tell that at this point without an ultrasound). What I Miss: It feels so lame that I can't think of anything, but I honestly haven't really been feeling deprived. It's a given that I miss wine and pumpkin beer, but I feel like I've been more ok with my deprivation this time around for some reason. Weird, I know. Signs of a Bump: Large and in charge! 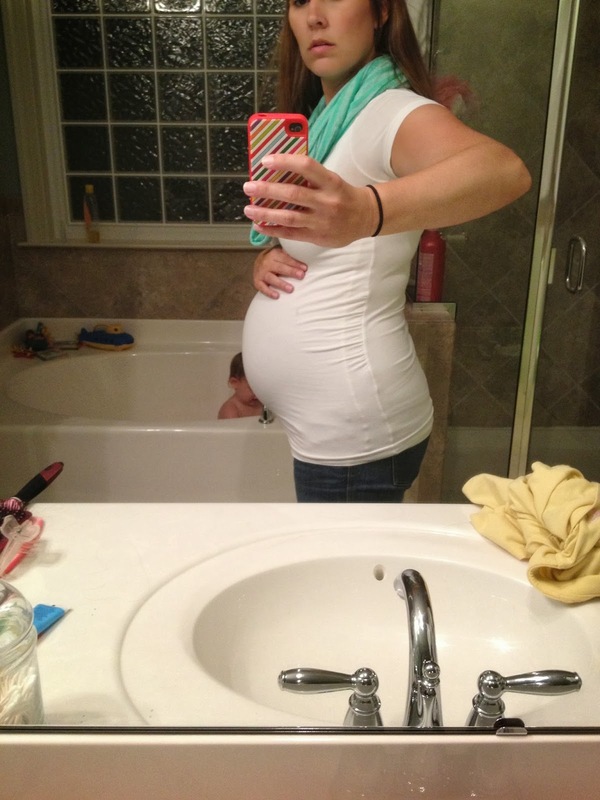 Excuse the messy bathroom (my husband will be so embarrassed that I posted this with the mess). And did anyone notice my little photo bomber in the background? Ha! Also not sure why I look mad here??? I'm carrying verrryyyyy differently this time around, for sure. What I'm Thankful For: I've still been thinking about what a fun weekend we had and how content I have been feeling ever since, so I guess I'm thankful for my sweet little family and the time we have gotten to spend together lately. What I'm Looking Forward To: Lots of things. For one, starting (and finishing, hopefully quickly!) this construction project and then starting on the nursery. I'm starting to get antsy and feeling like I need to check some things off of my list(s)! Also another weekend at home with a possible (hopeful) trip to the pumpkin patch with the besties. And seeing (and visiting!) the mountain house! I was jealous that Dan got to visit over the weekend and I haven't seen it in a while, and seeing all of the photos he and my sister took are making me even more ready for a Boone trip. Next Doctor Appointment: A week from today, 10/22. Hopefully it will be a quick one, but I know I'll be getting my glucose test supplies and info, and I'm not super excited about that part (even though it wasn't so bad last time). I'm off to blog stalk for 20 minutes and then go to sleep. Busy busy + insomnia = tired mama. Happy Tuesday!